Young hedgehogs are especially prone to releasing their bowels on their handlers. When you first get your hedgehog, expect to get pooped on! Hedgehog babies typically get better as they get older. Many animals (including humans) have to go to the bathroom when they wake up after a nap or a night of sleep. While the body is resting, it is still processing foods and wastes. Hedgehogs are no different, and they normally eliminate within 20 minutes of waking. It is a good idea to have a litter box or paper towel handy at the beginning of playtime. Some hedgehogs use the litter pan faithfully after they are first introduced to it. Other hedgehogs flatly refuse to use a litter pan. One hedgehog owner reported that her hedgehog suddenly started using the litter pan at the age of two. The benefits using the litter pan are well worth the small investment and effort required to set one up. Using a litter pan cuts down on cage cleaning, which in turn saves both time and bedding, as well as improves the overall hygiene of your hedgehog. 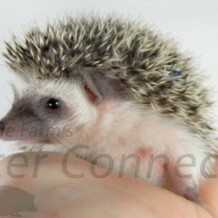 Hopefully, your hedgehog will begin to use its litter box in the first week or so of coming home. See our Litter Training Article for more information on this topic. Hedgehogs have the very unpleasant habit of pooping on their wheel. It is almost as if they are having so much fun running on the wheel that they can not take the time to stop and get off the wheel. Anyone who has potty trained a preschooler knows that sometimes playing is way more important than proper bathroom habits. Unfortunately, you can’t do much to stop this bad habit. We encourage waiting to put the wheel in the cage until after your hedgehog has established a good bathroom routine. One way to discourage wheel pooping is to limit wheel use. This may not always be practical but can be helpful in some cases. Wheels may need to be cleaned anywhere from nightly to weekly. One way to speed clean-up is to line the wheel with Glad’s Press’N Seal. The Press’N Seal can be regularly replaced. In some cases, placing a litter pan under a hedgehog’s wheel can help both in catching the wheel run off and in training your hedgehog to use the litter pan. Sometimes hedgehogs that typically have good bowel control have accidents because they simply have been handled too long and can’t hold it any longer. Many hedgehog enthusiasts joke that poop is a hedgehog gift. When your hedgehog is not scared of you and gives you a little gift, you can rest assured you have made a friend!